I've downloaded the Windows 10 IoT Core Dashboard and set up an SD card according to the instructions on that site. 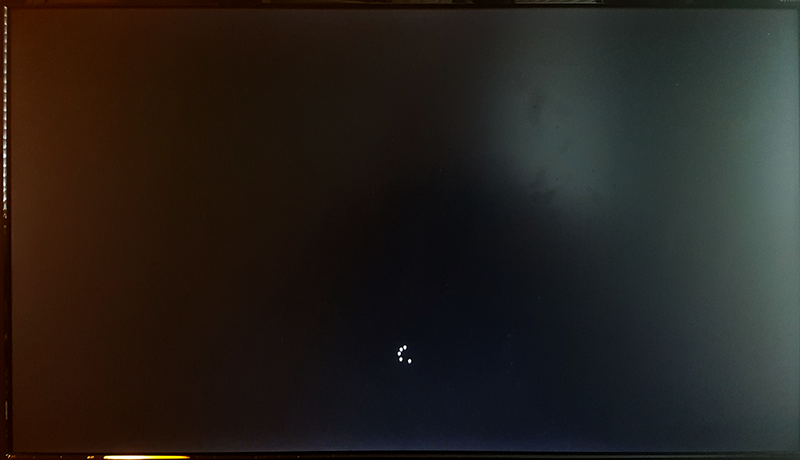 When booting my Raspberry Pi 2 from the SD card the Windows logo shows up with the spinning balls below. After a while, the Windows logo disappears, the spinning balls continue to spin for some seconds, then they freeze up looking like in the attached image below. However, it seems that Windows isn't completely frozen because I can ping the RPi and access the Windows Device Portal on port 8080, although it is very slow and I can't start any of the demonstration apps (even "Hello World"). Another thing to note is that the device name and password I set in Dashboard has not been set, as "My Devices" in Dashboard shows the default device name ("minwinpc") and I must use the default password ("p@ssw0rd") to log on to the Device Portal. So it seems that some Windows services are started, but not everything since the circles hang during boot and I don't get the default view. I'm running from a class 10 SD card, and my power supply can deliver up to 2.4A, so it doesn't seem like there should be a problem with either of these. How can I have my RPi2 start Windows Iot properly? What W10 IoT Core Release are you running ? You were right. The Insider Preview booted fully. However, on every boot I received a 0xc000014c warning about corrupt boot sector (or something along those lines). I just left it at that screen for about a minute (maybe two), then Windows continued and started up correctly. I occasionally had the same issue with the latest regular release as well, so it's not a preview specific issue.